Every time we so much as touch a toe out of state, cemeteries are on our travel itinerary—from garden-like expanses to overgrown boot hills, whether they’re the final resting places of the well-known but not that important or the important but not that well-known. After realizing that there are a lot of taphophiles out there, I’m putting my archive of interesting tombstones to good use. 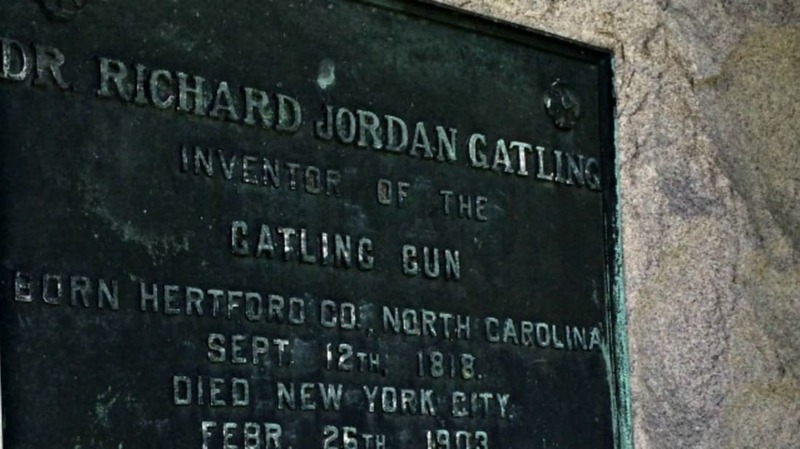 Gatling sold his gun patents to the Colt Patent Firearms Company in 1870, but kept his role as Gatling Gun Company president. He died at the age of 84 in 1903—after he had seen the decline of the Gatling gun as weapons that were truly automatic replaced it. He and Jemima, his “beloved and saintly wife” according to her epitaph, are buried at Crown Hill Cemetery in Indianapolis.